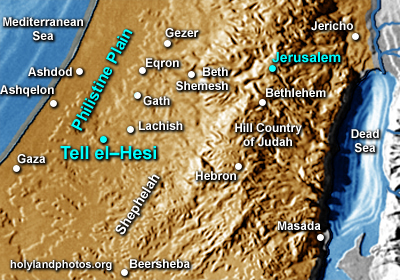 Tell el–Hesi is located in the southwest portion of the Philistine Plain, about 16 mi. northeast of Gaza. The lower city is about 25 acres in size while the citadel is 4 acres. Sir Flinders Petrie conducted the first scientific excavations here in 1890—setting the foundations for modern archeology.